What we see here is an unpainted Lando Calrissian (Skiff Guard Disguise) hardcopy. Return of the Jedi hardcopies tend to show up with the most frequency but this does not make them any less significant. Take notice of the color of the figure. Since this is a post-1982 action figure it was cast in a green resin called Dynacast. Hardcopies are created in such a way so that they can be disassembled. They are normally held together with either metal or plastic dowels. Though we do not have a shot of the hardcopy disassembled one can just make out the metal dowels where the head and right arm are joined to the torso. Hardcopy weapons and accessories are often lost or damaged so it's a real treat to see that this figure still has it's original hardcopy helmet. 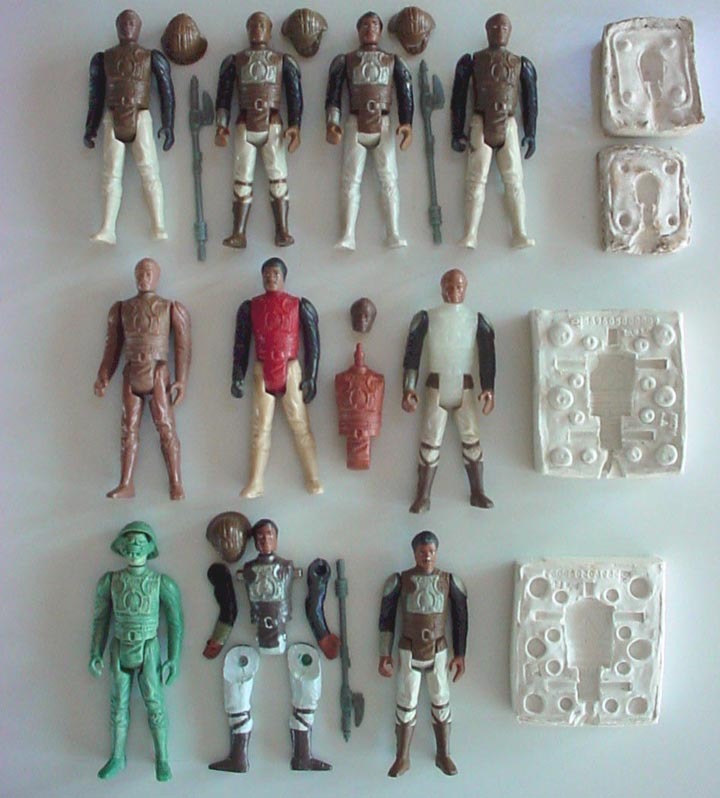 The second image shown is a group shot of several stages in the production process of the Kenner, Lili Ledy, and Top Toys Lando Calrissian (Skiff Guard Disguise) action figure. The image includes several early and late first shots, an unpainted Kenner hardcopy, a painted Top Toys hardcopy, a painted Kenner protomolded figure, and the head and torso silicone molds for the Top Toys hardcopy. Those interested in the Lando Calrissian (Skiff Guard Disguise) action figure may also want to view this painted hardcopy. Make no mistake a run like this is not easy to assemble and I'd like to thank David for sharing images of this marvelous view into the creation of Lando Skiff.